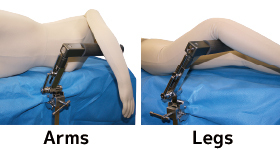 ◆The arm moves freely, and it is possible to perform surgery under X-ray fluoroscopy while avoiding the side rail. ◆It is possible to sterilize all parts in both high-pressure steam sterilization and EOG sterilization, making it possible for surgeons to touch and move the positioner by him/herself. 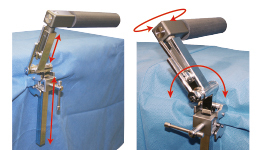 ◆By using Universal Clamps, it is easier to attach the positioner over the cloth on the operating table in clean condition.